Basically you cannot go wrong ordering anything off the menu at this favourite mountain hut. 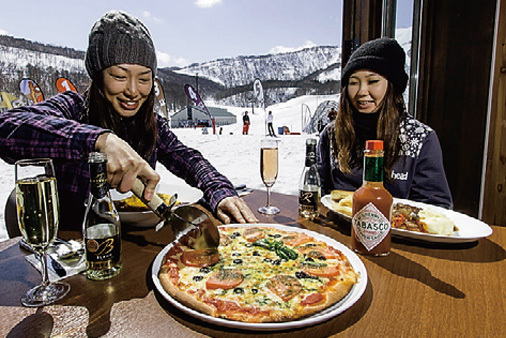 It is old school and despite Niseko’s extensive development, retains all its original charm, serving the most hearty and delicious meals on the mountain. Fish lovers have a treat in store with the ikura don. Salmon roe of a quality you won’t find better outside Japan is served plentifully on top of warm rice together with miso soup and pickles. Tea and water are provided free of charge. A filling, delicious and uniquely Japanese treat. To emphasise our love of boyo-so, our second recommendation comes from here too. If the dish’s amusing name, ‘mother and child served on rice’, doesn’t sound too appetising, then a pleasant surprise is in store. Fried chicken and egg are served together on top of rice and served with miso soup. An extremely satisfying combination, perfect before heading back onto the slopes. Generous quantities of fresh Hokkaido carp and tasty broth define this classic ramen dish. A favourite at Hanazono 308 for years, locals and visitors alike come back for more year after year. And there is nothing like a huge bowl full of noodles to fill you up! Japanese curry rice is everywhere (and is a very nice too! ), but Hokkaido soup curry is something special. A local delicacy, a thin but flavourful broth is accompanied by hearty chicken, vegetables and rice. The award winning interior design and spectacular views from The Lookout Café don’t hurt either! Mountain food is one thing, but for an authentic sushi restaurant, you might think you would have to head into the Village or even Kutchan, but you would be wrong. The best sushi in town can be found in the Alpen Hotel which is located at Dot Base. Here your favourite sushis, sashimis, set meals and rice dons will be freshly prepared with quality you would be happy to find in central Tokyo. To book your Niseko snow holiday, get in touch with local specialists Japan Ski Experience.